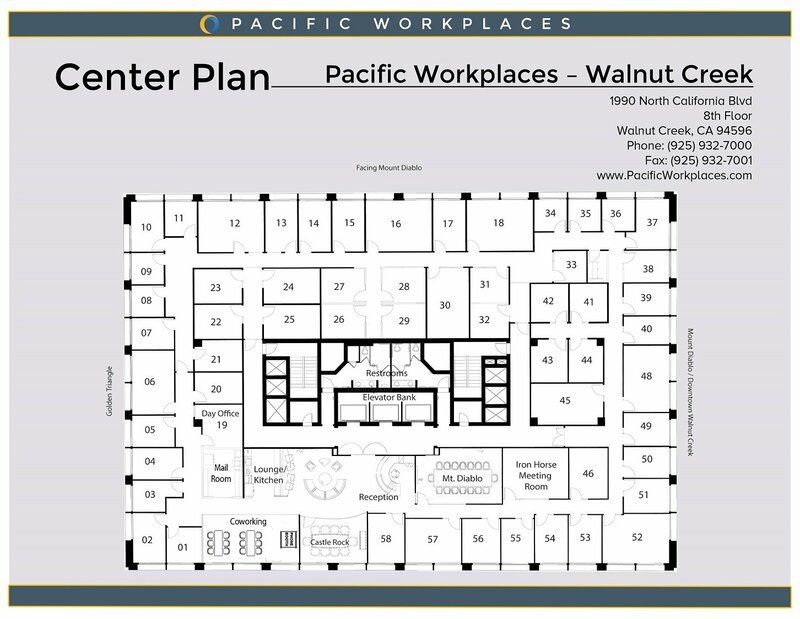 Pacific Workplaces Walnut Creek (a.k.a. ‘Pac’) currently offers 60 furnished private offices for individuals and teams under short term agreements. Our 10-story building offers spectacular views of Mt. Diablo, downtown Walnut Creek and the Golden Triangle. As a full-service workspace provider, we offer everything from live phone answering, reception services, administrative support, video conferencing, and access to meeting rooms to help make your day productive. Request a quote. With over 100 memberships, we are well-versed in the needs of mobile workers. We realize that your office is wherever you are, that you need a convenient place to meet clients, a huge screen for your team to collaborate, and a quiet place to get work done, but not necessarily a dedicated office. It’s with that in mind that we created our virtual office space plans for part-time officing. Of course, we’ll collect your mail, answer your calls, and provide unified messaging to maximize your productivity. All while you work virtually from anywhere, including from your home office or on the road! We offer four designated meeting spaces and day offices ranging in size. Each meeting room is named using local, well known landmarks, such as the Mt. Diablo Boardroom and the Iron Horse meeting room. Spaces are equipped with flat screen displays, large whiteboards, conference phone, and video conferencing technology. Our onsite staff is always nearby to ensure everything runs without a hitch. We have a brand new coworking area of open workstations available for easy drop-in access. 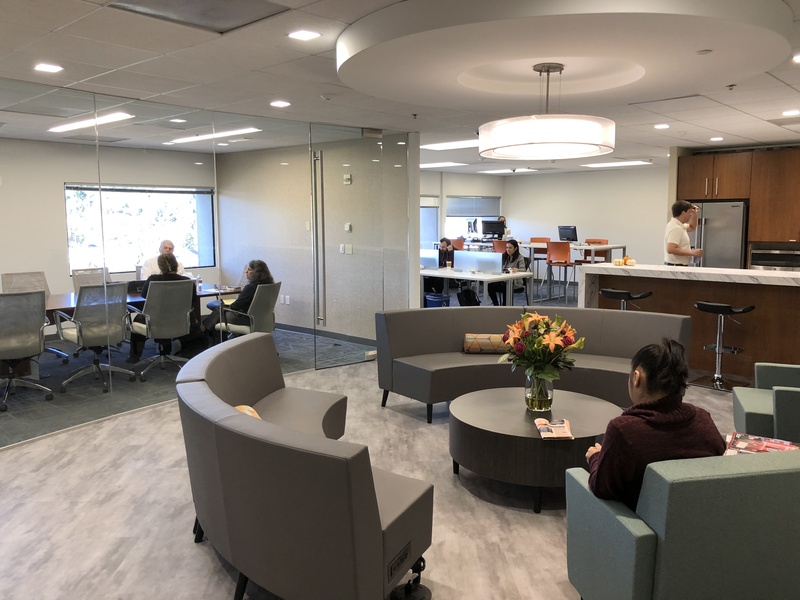 With the addition of our coworking space, our Walnut Creek location will offer every type of workspace from private offices to open spaces allowing you to choose how you want to work. Our designated coworking area will complement our existing member community of ‘Pacmates’ who like to network or simply chat on a more personal-level. Walnut Creek members also have the benefit of utilizing CloudTouchdown passes – provided by our sister company CloudVO – to touchdown at any of the 700 locations available within our network. Financial advisors, engineers, architects, authors, mortgage brokers, estate planners, attorneys, and software developers are just some of the incredible members that make up our community. Most of our members live in and are active in the community. Whether it’s having a conversation while enjoying a cup of Peet’s coffee, cheering on a local Bay Area sports team, or showing up for one of our fun monthly community events, our Pacmates enjoy hanging out together. This level of comradery can be felt as soon as you walk through the door. 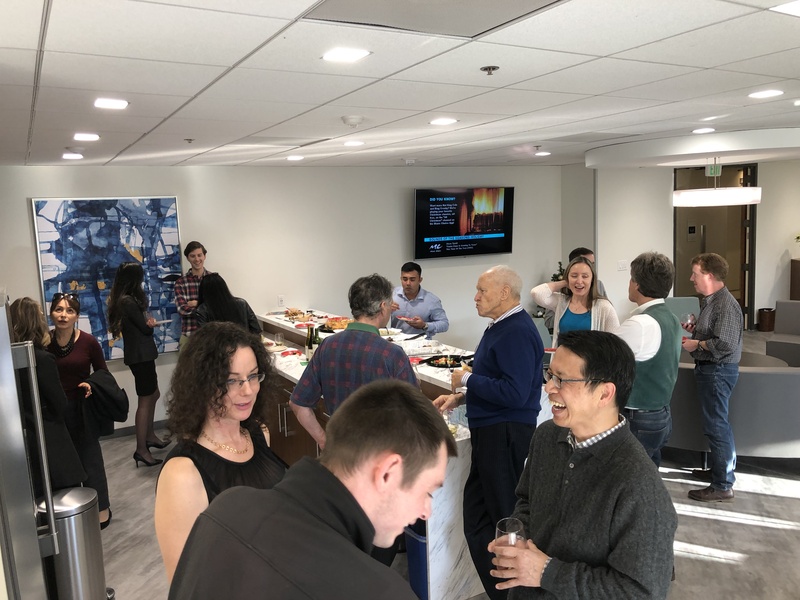 A central location with a diverse community of professionals, entrepreneurs and startups, including full time and virtual offices, complete with stunning views of Mt. Diablo and a bustling small city makes our Walnut Creek center the place to relax and get it done! With BART right across the street and highways 24 and 680 close enough to check out a live traffic report, this convenient location makes it easy to pick up your mail or meet with clients. Take a break from the office and hit the town for some lunch from one of our local cafes within walking distance. A delightful mix of boutique businesses accented with major companies such as Target, Starbucks, and a 24-Hour Fitness gym on our block create a capacious space to do business while providing easy accessibility to life beyond the workplace. View our cost comparison analysis with Regus Walnut Creek to see how we stack up against our local competition. Our Pleasant Hill Office is less than five miles from downtown Walnut Creek! We also have great coverage in the East Bay with locations in Oakland and Berkeley.